The stylistic split of power versus finesse or “New World” versus “Old World,” is still ever present, but is being moderated to some degree as producers seek for a balance between the two extremes. Traditionalists still prefer so-called “Table Wines,” arguing that they go best with food and are suited for drinking sitting down. French Burgundy is often used as an example because the wines are typically lighter, less fruity, lower in alcohol, and higher in acid. These are frequently referred to as “Old World” style and are more like see-through red lingerie than Jimi Hendrix purple. On the other side are the proponents of “Social Wines,” often referred to as “New World” style because of their upfront fruitiness, extraction, and higher alcohol. They have assumed numerous monikers including “Big Babe Pinots,” “Jelly-jar Blockbusters,” “Show Wines,” and “Wines on Steroids.” They are more Pamela Anderson than Katherine Hepburn. Most pinotphiles can enjoy and appreciate both styles and everything in between. The appeal of wine lies in its diversity. Nose: A complete wine will have more than one family of aromas (fruits, flowers, spices, etc). Taste: A complete wine will have more than one family of flavors and all of the flavors are in harmony. Texture: Also called mouth feel, unctuousness and roundness (moelleux). Texture is the tactile sense of wine in the mouth, on the tongue, and in the throat. It is very hard to describe, but complete wines have great texture. For Pinot Noir, a soft and smooth texture is frequently preferred. Silky textures give Pinot Noir its sexiness. Finish: There are two kinds: aromatic, referring to how long aromas last on the palate after the wine is swallowed or spat out, and gustative, indicating which taste (acidity, tannin, alcohol, or roundness) leaves a lasting impression. A complete wine will have a long aromatic finish lasting several seconds and an appealing taste at the end. Balance: Also known as harmony, balance refers to the relative levels of acidity, alcohol, tannins and roundness that are felt in the mouth. Aromas have nothing to do with balance. A well-balanced wine has all of these elements in equal amounts with no element sticking out. A complete wine will have impeccable balance. If a wine is unbalanced at the start, it will never become balanced no matter how long it is aged. Aftertaste: This term is often confused with finish. An aftertaste is always a defect in wine. Some aftertastes include metallic, bitter, and sulfur. A complete wine has no aftertaste. I consider the All-American wines to be complete wines. Regarding prices, for the most part, life begins at $40. Many of the All-American Pinot Noirs are sold out at the winery and only available on the secondary market. Keep in mind that there will always be another vintage, and top producers make quality wine in most every vintage. It will not be the same song, but it will be by the same composer. The wines are listed in alphabetical order. I consider a value Pinot Noir to be one priced below $20. The lower limit for this category is about $13. These Pinot Noirs are quite good for daily drinking and are true to the varietal. They lack some of the complexity and subtle nuances that make more expensive Pinot Noirs so desirable, but do offer fine drinking with meals. They are sold by the winery and widely available in the retail marketplace. There were many, many Pinot Noirs from Burgundy, New Zealand, and Australia that were memorable in 2006. The wines listed below were particularly epiphanic. Best American Pinot Noir vineyards (potentially great quality from multiple producers): Shea (Oregon), Hirsch, Summa, Peay, Sangiacomo, Kanzler, Rochioli, Olivet Lane, Buena Tierra, Savoy, Pisoni, Garys’, Rosella’s, Bien Nacido, Rancho Ontiveros, Talley Rincon and Rosemary, Fiddlestix, Clos Pepe, Sanford & Benedict. In the most recent issue of the Wine Enthusiast, the editors selected the top 100 wines of 2006. This has been quite fashionable since the Wine Spectator started the trend a few years ago. The Wine Enthusiast selected the best 100 wines from nearly 10,000 total wines tasted. Besides taste, the editors looked at price, availability, newsworthiness (?? ), and excitement (???). Imagine my surprise, when I opened the article to find the Number One Wine of 2006 was the 2004 De Loach 30th Anniversary Cuvée Russian River Valley Pinot Noir. 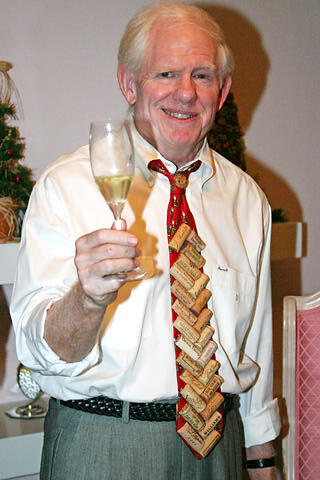 DeLoach emerged from bankruptcy a couple of years ago and has been resurrected by the large wine conglomerate, Boisset America Talented winemaker, Greg LaFollette, is now in charge and is steering the venerable label in the right direction. The tasting room has been renovated under the direction of noted architect Howard Backen to create a welcoming country farmhouse feeling. 14.9% alc., 350 cases, $45 (sold out). This commemorative bottling comes from the original De Loach estate Pinot Noir vineyard adjacent to the winery planted in 1977. The vines were removed after the 2004 harvest and replaced with new plantings farmed biodynamically. The wine was made with 100% whole cluster fermentation in open top wood fermenters. Aging was in French oak for 10 months. 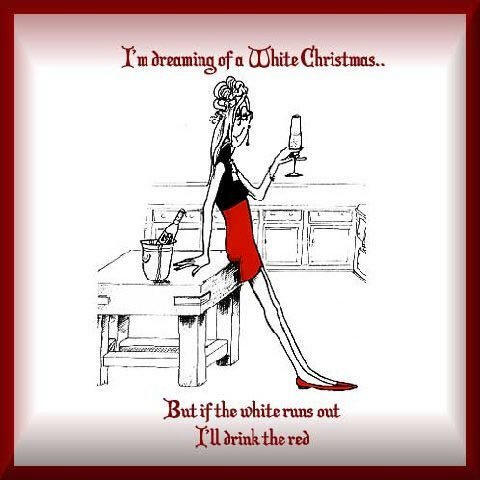 · I drank this wine twice this past year several months apart with consistent notes. It is a medium-bodied Pinot Noir which really needs significant air time to reveal its charms. Initially the nose is closed. Flavors of herbs, oak, plum and cranberry lead to a finish which is stemmy, herbal and moderately astringent with a hint of heat. The texture is smooth and satisfying. I left an opened bottle overnight and re tasted the next day. The nose had cleaned up significantly with appealing toast and cherries. The overall impression was more mellowness and the back end astringency had resolved. The finish now featured some lingering spice and a hint of oak. This wine will benefit from a couple years in the cellar. A decent Pinot with potential, but just not my cup of tea (pinot). When you consider taste, price and availability, I just don’t see how this wine could be the Top Wine out of 10,000, let alone the top Pinot Noir. I recently had the 2005 De Loach Russian River Valley Pinot Noir which was served by the glass at a restaurant. This wine was thoroughly enjoyable as a luncheon companion and highly recommended for $20. De Loach also offers an OFS Pinot Noir (‘our finest selection’, $35)), and single vineyard Pinot Noirs from Green Valley and Moborishi Vineyard ($42-45). De Loach Vineyards tasting room is open daily from 10:00 to 4:30. Wines are paired with gourmet breads, artisan cheeses and chocolate. There is a small charge for tasting. The winery is offering weekend-long Yoga retreats in 2007 at the winery’s private guest house directed by noted Bay Area yoga instructor, Rosemary Garrison. Vegetarian meals will be featured using produce from the winery’s 18,000 square-foot organic garden and will be prepared by winery chef Cyndicy Coudray. Cost is $1000 pp. The winery’s phone number is 707-526-9111. The wines are sold on the website at www.deloachvineyards.com. The address is 1791 Olivet Rd, Santa Rosa, CA 95401. 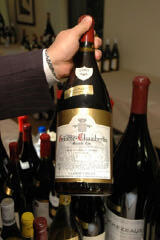 The annual Le Paulé Burgundy tasting in New York City will be held March 3, 2007. It is a homage to La Paulée de Meursault, which has formally endorsed this celebration. Presented by Daniel Johnnes, the event includes a Grand Tasting from 12:00 to 3:00 PM ($250) and a Gala Dinner from 6:30 to midnight ($1400). The Grand Tasting restaurants are Bouchon, Café Boulod, Cru, D’Artagnan, Eleven Madison Park, Hearth, Ma Cuisine, Mai House, March, Rosewater, Telepan, and Veritas. The chefs for the Gala Dinner include Daniel Boulod (Restaurant Daniel, NYC), Michael Mina (Michael Mina, SF), Olivier Muller (DB Bistro Moderne, NYC), and Michel Troisgros (Maison Troisgros, Roanne, France). This event is a marvelous opportunity to share the bonhomie of fellow Burgundy lovers, as well as a chance to meet elite winemakers and savor their wines. 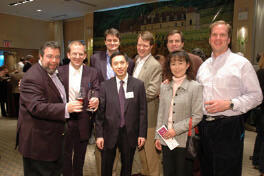 In 2006, sixteen Burgundy winemakers will be featured including: Domaine de L’Arlot, Domaine Bonneau du Martray, Domaine Bouchard Pére et Fils, Maison Champy, Domaine du Clos de Tart, Comte Armand, Domaine David Duband, Domaine Dujac, Domaine Geantet-Pansiot, Maison Henri Boillot, Maison Louis Jadot, Domaine Michel Lafarge, Domaine des Comtes Lafon, Domaine Matrot, Domaine Ballot-Millot, Domaine Méo-Camuzet, Domaine Mugneret-Gibourg, Domaine de la Pousse d’Or, Pierre-Yves Colin-Morey, Domaine William Févre, and Domaine de la Romanée-Conti. In the true spirit of La Paulée, guests are invited to bring with them their own Burgundian wine treasures to share with the group. 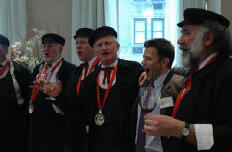 Les Cadets de Bourgogne, a troupe of traditional Burgundian singers, will serenade the attendees. Robert Parker, Jr. has praised the event, saying “Any Burgundy enthusiast who does not jump at the opportunity to attend this event is crazy, as it is the dinner/tasting of a lifetime.” And Wine & Spirits remarked that Le Paulée is “...a chance to taste more great Burgundy than many taste in a year, or a lifetime… ” For reservations: 212-625-2519. Winemaker Greg Saunders of White Rose Vineyards in the Willamette Valley wrote me on the subject of minerality in wine which I briefly approached in the last issue. I find his comments useful. So, in effect, minerality is a descriptive word for wine which has no common definition and a lack of evidence exists that minerality from the soil can actually influence wine flavor. Say what? Vinocruz A new downtown Santa Cruz wine shop features almost exclusively wines from the Santa Cruz Mountains. The store offers 150 selections from 65 wineries. The owner, J.P Correa, hopes to raise the profile of wines from the Santa Cruz Mountains, an appellation with 80 wineries, but only 10 tasting rooms. Many very small producers are featured including Clos Tita, Aptos Creek Vineyard (200-240 cases of Pinot Noir a year), and McHenry Vineyard (300 cases of wine a year from a vineyard in Bonny Doon). For information: www.vinocruz.com or phone 831-426-8466 (VINO). The Cork Dorks A new series for public television, “The Cork Dorks,” will be produced by WBGU-TV, Bowling Green, Ohio, and Vite Vista, LLC. The show will focus on wine education and enjoyment and attempt to demystify wine. Dan Greathouse and Keith Morris are the hosts who will go behind the scenes to explore winemaking. A sneak preview is available at www.thecorkdorks.com. Fre Wines Sutter Home has a lineup of non-alcoholic wines, named Fre, which includes a brut sparkling wine and, of course, white zinfandel. The idea is no alcohol and less calories - ideal for the designated driver who wants to join the Holiday festivities. Sorry, no tasting notes. WineAuctionPrices.com An online database of wine auction prices started by WineCommune LLC in partnership with William Edgerton, an expert in wine appraisal and the former editor of Wine Price File. Wine enthusiasts can appraise their collections and research wines by vintage, bottle size, auction house, date, lot price and bottle price. 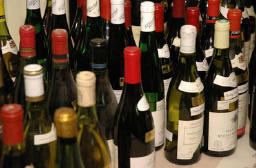 Soon there will be a feature that alerts subscribers to wine available at auction before the auction occurs. Subscriptions are $99 for one year at www.wineauctionprices.com. Guide to Willamette Valley Wineries Available free at www.williamettewines.com.